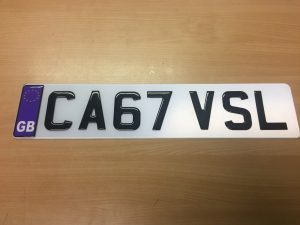 Dash Dynamics manufacture high quality Black 3D Resin domed number plate letters, each of which are commonly used in the production of bespoke number plates. We manufacture in compliance with Section II of the Road Vehicles (Display of Registration Marks) Regulations 2001, our 3D number plate letters are a legal way to increase the overall aesthetic design of your customer’s vehicle. Unlike certain competitors, the 3D lettering we supply for use on your plates doesn’t interfere with the legibility of the registration marks and contains no reflective properties, so you can rest assured that they won’t raise any issues with the authorities, subject to correct approved spacing of the letters. Your customers can take advantage of having a bespoke 3D number plate made. The embossed lettering allows for the registration marks to be raised from the plate itself to create that luxury effect. As part of our comprehensive services, we also produce country and EU Resin domed end badges for an additional aesthetic appeal. Our 3D number plates have featured in Max Power and several other motoring publications. We have become the number one stop for our 3D number plate system, provided to registered plate companies*. 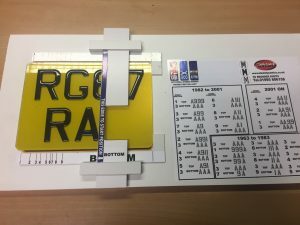 Our Jigs used in the creation of these 3D number plates assist in the accurate placing of our letters to current automotive standards, ensuring that perfect results are achieved every time. Dash Dynamics now offers motorcycle 3D number plate letters. We are currently looking for stockists and distributors throughout the UK. Jigs are available for the accurate placing and production of each plate. If you are interested in becoming a stockist or distributor for our custom 3D motorcycle plates, we would be interested to hear from you. If you are already producing number plates and you are looking for additional finishes, our 3D number plates perfectly complement any vehicle, and are becoming an increasingly popular choice amongst motorists. Our 3D number plates are produced and distributed throughout the UK via our authorised distributors. If you are interested in ordering high quality 3D number plates from a secure provider, get in touch today. Contact us by phone on 01995 606 158 or send an email to info@dashdynamics.co.uk. Alternatively, you can fill out our quick and simple online contact form, and a member of our team will be in touch as soon as possible. We look forward to hearing from you. *Please note: We do not supply the general public with either complete number plates or letter sets for you to fit yourself. Contact one of our experts to discuss your requirements.